Meditation is practice in letting go. In meditation the ten thousand things arise, and we let them be. A kaleidoscopic cacophony of sensations, thoughts, and reveries arise and vanish — fleeting specters in the Cartesian Theater of the mind. We have hopes and expectations for what each moment of meditation will be like: “I will stay alert, focused, calm, and peaceful.” “My meditation space will be quiet and comfortable.” “I will learn something… make progress… taste Enlightenment.” Our practice is to continually let go of these hopes and expectations and let the ten thousand things be as they are. We effortlessly open to each moment, accepting each moment as it is, embracing it, experiencing it fully. We meditate in order to learn how to let go in our daily lives. We need to learn how to let go because trying to hold onto anything is like trying to nail jello to a wall: Nothing sticks, nothing stays. When David Chadwick  asked Suzuki Roshi to express the heart of Buddhism in just a few words, Roshi replied “Everything changes.” (If David had asked him another time, would he have gotten a different answer?) We can’t hold onto a world that’s constantly changing and transforming — we can’t make the world stop being the world. “Clinging” is another word for “holding on.” The Buddha taught that clinging was the ninth link in the chain of Dependent Origination. In that chain, craving led to clinging, and clinging to “becoming” (bhava), i.e., to continued stuckness in cyclical existence. There are two places where the chain of dependent origination can be broken: at the point where a pleasant feeling turns to craving, and at the point where craving leads to clinging. We can break the link of craving through awareness of its dangers and insight into where it will lead us. We can break the link of clinging by simply letting go. Sometimes the Buddhist message about craving, clinging, and attachment is misunderstood. People misinterpret it to mean that we should be free from desire and interpersonal relationships. In Buddhism there are good desires — the desire to help others, to be happy, and to become enlightened are prominent examples. The desire to be a good parent or a good spouse are others. Another way of saying this is that aspiration is all right, but craving is not. Cravings are intense desires that are fixated on a particular object or experience. There is a tightness, rigidity, stereotypy, or “must-ness” about them — like the addict craving a fix; the overeater, a binge; the miser, more wealth. Satisfying a craving leads to transitory pleasure, but as the pleasure fades, more craving ensues. Cravings have a way of taking over our lives and enslaving us. Love is when you are thinking ... "how can I make you happy?" Attachment is when you are thinking ... "why aren't you making me happy?" In Buddhism attachment refers to a rigid, tight clinging and holding on to something, as if it were an existential life-raft. Think, for example, of a person clinging to a relationship that’s already dead and unable to move on. He keeps returning to a dry well, hoping for water, stuck in recurrent despair. He may even resort to stalking and violence, hoping against hope to control the other person who wants nothing more of or from him. Similarly, nothing kills relationship as quickly and thoroughly as clinging — clinging stifles and suffocates the loved one, dragging the loved one down into the swamp of the clinger’s neediness and efforts to exert control. We can cling to other things besides relationships. We can become stuck in an unrewarding job, or stuck on a goal that’s beyond our talents (or a poor match for what could really make us happy). We can become attached to money, possessions, popularity, and status. We can believe we’re promised or owed these things by life, and become resentful when they’re not delivered, thinking life has given us a raw deal. We can become attached to all kinds of beliefs about how life is supposed to be. “Life is supposed to be easy!” “Life is supposed to be fair!” “Bad things are not supposed to happen to me!” “I should be further ahead in life!” “I’m not supposed to be ill, sick, handicapped, or dependent!” “Raising children (or working for a living, or marriage) shouldn’t be this hard!” “Other people should appreciate me more!” “I should be better, smarter, braver, more loving, more perfect!” Psychologist Albert Ellis used to jest that whenever we placed demands on how life “must” be, we were engaging in “must-erbation.” We are happier when we let go of our demands on life, and accept life as it is, and ourselves as we are. That doesn’t mean we cease making efforts to improve ourselves and our circumstances – it’s just that we don’t demand that our efforts always succeed. We understand that when we want to make God laugh (as Anne Lamott so aptly wrote) we tell Her our plans. We understand that there is no such thing as perfection. There is just life as it is. So we sit in meditation, practicing letting go. Breath by breath. Moment by moment. Again and again. We observe the places where we get caught, where we get stuck, the places where we get tight, the places where we separate ourselves from the moment with thoughts about how the moment ought to be. And we breathe. And we let go, loosen, and unfold. 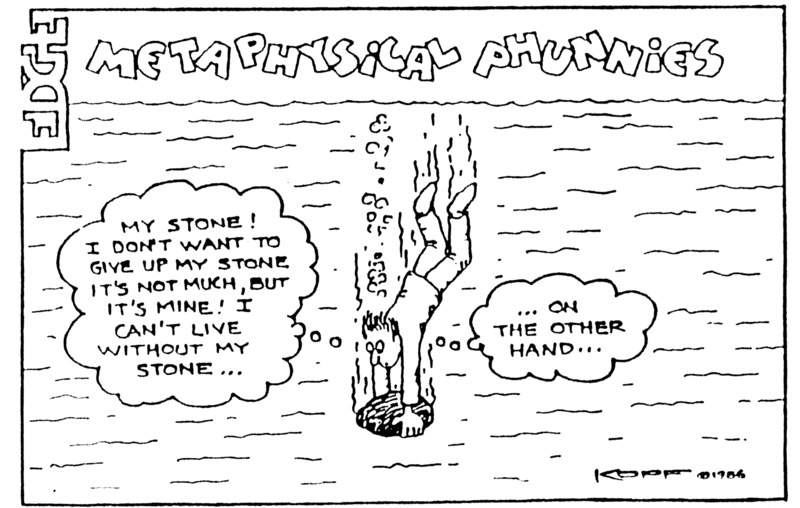 Special thanks to L. J. Kopf ([email protected]) for permission to use Metaphysical Phunnies in this post. Don’t go by reports, by traditions, by scripture, by logical conjecture, by inference, by analogies, by agreement through pondering views, by probability, or by the thought ‘this contemplative is our teacher.’ When you know for yourselves that ‘These qualities are unskillful; these qualities are blameworthy; these qualities are criticized by the wise; these qualities when adopted and carried out lead to harm and suffering’ — then you should abandon them.